Melissa & Doug Sunny Patch Outdoor Toys were designed to encourage kids to get outside and play, and what could be better than that? From babies to toddlers to elementary school kids, these quality toys are made to foster creative and imaginative play. Encourage your children to examine nature with the Blossom Bright or Mombo Snake magnifying glasses or help Mom with the gardening with their own bright rake, trowel, shovel and watering can. Get them moving with the Bella Butterfly Tunnel or stir up a game with the Froggy kickball or Bella Butterfly kickball. Help them imagine their own adventures with a Tootle Turtle or Mollie tent. 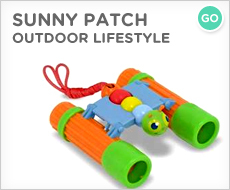 From flashlights to binoculars to raincoats, the Melissa & Doug Sunny Patch Outdoor Toy line equips your kids for fun in the sun, clouds, drizzle, or whatever the day brings. Melissa & Doug toys are quality toys that will be passed down from one sibling to the next.